QuasarDragon: Monday Free Fiction Part 1. Monday Free Fiction Part 1. 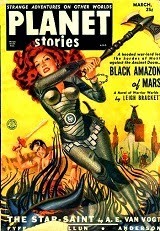 Beginning the day's free fiction links with a new audio version of Leigh Brackett's Mars adventure. "Black Amazon of Mars," Cat Rambo audio at Escape Pod, and much more. "When the man came into her sphere of perception, she had almost not realized he was there, concentrating as she was on the new nest of cardinal chicks that rested high on her south side. So occupied was she on shifting her branches just so to protect the nestlings, it wasn’t until the male cardinal reacted with alarm that she turned her awareness down from her branches to her roots." • At L5R: "Star-Crossed Lovers" by Shawn Carman. Fantasy. "Yasuki Tono poured himself a cup of hot tea. It was Jade Sunrise blend, the one he had come to enjoy the most during his time in the Colonies. He missed his favorites from the Empire, but it seemed a small price to pay for the opportunities he had been afforded since his arrival here. From across the room he heard a familiar chuckle, and he did not look in that direction." • At Mad Scientist Journal: "On Dosing the Water Supply with a High Powered Mind Control Mutagen" by Brandon Miller. Science Fiction. "I want to take this opportunity to clear up the misconceptions about the events of April 20, 2013, at the Carson City water reservoir. My former assistant, Gregory, has been telling his side of the story to every National News Agency, as well as to several nasty authoritarian groups. They are now hunting me down as though I were a rabid dog. As if they could actually catch me. I can’t wait to see the look on Gregory’s face when he finally comes to his senses, and comes crawling back to me." At Daily Science Fiction: "How Hagatha One-Eye Fell Off the Wagon" by Matthew Cote. Fantasy. At Every Day Fiction: "Wish Fulfilment" by Georgina Allen, read by Folly Blaine. Fantasy. Audio. At Every Day Fiction: "The Underground" by Rebecca Birch. Horror. At Flashes in the Dark: "The Stake and Garlic Factory" by Michelle Anderson, Horror. At 365 Tomorrows: "Before Resurrection" by Andrew Bale. Science Fiction. At 365 Tomorrows: "A New Face" by Alexis Voltaire. Science Fiction. At Toasted Cake: "What Makes You Tick" by David Steffen. Audio. • At Cast of Wonders: "Daphne’s Daughter" by Jennifer Tiemann, read by Veronica Giguere. • At Escape Pod: "On the Big Fisted Circuit" by Cat Rambo, read by Shaelyn Grey. Science Fiction. "This was the biggest suit she’d ever crawled into. It meant money: money dripping through the wires around her, money in the gleaming metal struts, money being made by every step it took, money her family needed, every step a week’s rent and food if they were careful with it." • At The Fantastic Worlds of Edgar Rice Burroughs: "Episode 2 - The Son Of Tarzan" Adventure. "Chapter II It is ten years following the events recounted in The Beasts of Tarzan. Alexis Paulvich has been rescued from the banks of the Ugambi River. Enroute to England, the ship stops at a jungle island, where a great ape seems to bond with Paulvich, now using the name Sabrov. The ape, named Ajax, and Sabrov return to London." • At LibriVox: "Black Amazon of Mars" by Leigh Brackett, read by Phil Chenevert. Science Fantasy. "This gore drenched story finds Eric Stark, the barely civilized warrior raised on Mercury struggling to bring a dying Martian friend back to his home city in the North of Mars before he passes away. Unfortunately his friend does die on the way and lays a most unwanted last request on Stark before the end; to bring a precious stolen talisman back to the city. The journey there introduces the intimidating Black Amazon of Mars." Flash Fiction at Every Day Fiction: "Justice" by Ken Poyner. Flash Fiction at Linguistic Erosion: "What a Wonderful World" by Leonard Treman. Poem at Leaves of Ink: "Cherry Blossom Rain" by Paula Ray. Poem at Leaves of Ink: "The One I Loved" by Sergio A. Ortiz. Under "Audio Fiction," the link to "On the Big Fisted Circuit" is broken. OldMiser - Thanks, fixed it now! David - Will link it.